Apache Camel empowers you to define routing and mediation rules in a variety of domain-specific languages, including a Java-based Fluent API, Spring or BlueprintXML Configuration files, and a Scala DSL. It also uses URIs to work directly with any kind of Transport or messaging model such as HTTP, ActiveMQ, JMS, JBI, SCA, MINA or CXF, as well as pluggable Components and Data Format options. 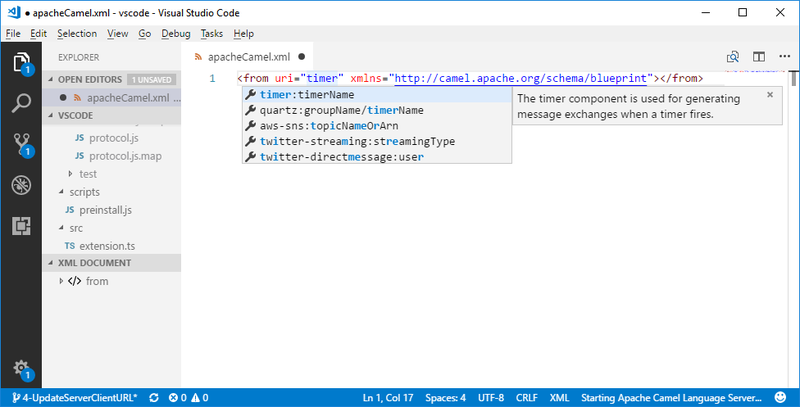 Apache Camel is a small library with minimal dependencies for easy embedding in any Java application. A few weeks ago, I blogged about Apache Camel URI completion in the Eclipse XML Editor. This week I'm happy to announce that the same feature is available for 2 others IDEs: VS Code and Eclipse Che. The VSCode client is consumable right now using the .vsix file available on the release page. See the instructions on how to install it through a .vsix file here. For Eclipse Che, it is currently only on the master branch. It will be available to end-users in an easy way with the next release, 6.1.0. This means that it will also be available on OpenShift.io in a few months. Published at DZone with permission of Aurélien Pupier , DZone MVB. See the original article here.